What can I expect from a treatment ? 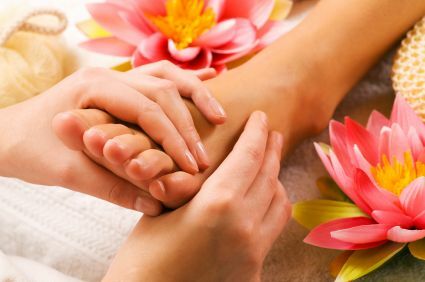 If you have never experienced reflexology before, you may be a little nervous prior to attending your first appointment. Please don't worry ! It's a very relaxing experience and I'm more than happy to answer any questions that you may have. The only clothing required to be removed for reflexology is socks or tights and your shoes. It is best to wear loose comfortable clothing so that you feel relaxed. At the start of your first session, I will conduct a health and lifestyle consultation. This will involve finding out about any medication that you take, illnesses and your reasons for trying reflexology. Having built up a picture of your current state of health, I will explain how reflexology works and will then examine your feet. You will be asked to recline in a chair and will be made comfortable. points. You may wish to close your eyes and relax or you might prefer to chat during your session, this is entirely up to you. During treatment I will apply a small amount of talcum powder to help my fingers and thumbs work smoothly across the reflex points on your feet. The pressure is firm, but not painful or too tickly ! I will work both feet during the course of a treatment and may revisit certain areas repeatedly to help balance particular reflexes, concentrating on areas identified during the consultation process. All information recorded will be treated in accordance with the Data Protection Act and will remain totally confidential. The initial treatment will typically last around 90 minutes and subsequent treatments approximately 60 minutes. After your treatment, you will be advised to drink plenty of fresh water, to help flush toxins from your body. It is also recommended that you avoid alcohol and eat only light meals. Sometimes people report feeling lethargic, cold, thirsty or sometimes emotional after treatment. This is perfectly normal and will pass. It is impossible to predict exactly how the body reacts, as the reactions are all individual.